This was relayed by Commodore Albert Mogol AFP, Commander of Philippine Navy’s Fleet-Marine Ready Force in a Facebook message to the organizer. The “tulong Marawi is on the way to Iligan for turn over to DSWD there. Na deviate ang mission ng BRP Tarlac to Tacloban and then Cebu to deliver goods to victims of TY [sic] Urduja and Vinta”, Mogol said. “Nakarating na ang relief goods from Thailand to Marawi. It was truned over by PN CMOU personnel to Marawi LGU last January 19, 2018. Maraming salamat sa AFT’, Commodore Mogol added. A total of 239 Filipinos from Bangkok, Pattaya, Bo Win, Sattahip, Rayong, Nonthaburi, Chantabuti and Trat came together to support the event. Around 50,000 THB was collected which was used to buy 40 sacks of Thai rice and other goods. 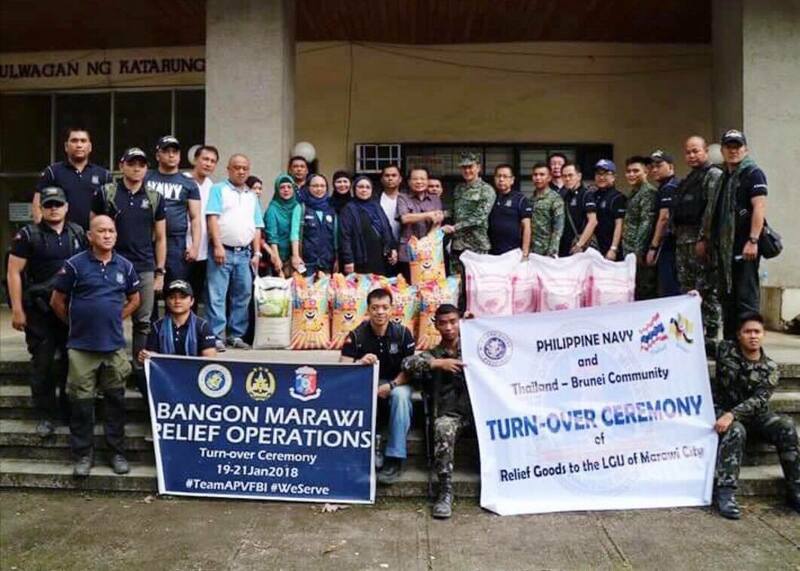 The message continued that the relief goods and donations from Thailand were turned over by PN VMOU personnel to Marawi LGU last January 19, 2018. On behalf of the affected individuals in Marawi, thank you very much for joining our efforts in rebuilding a new and better Marawi. Maraming maraming salamat po! Rebuilding Marawi Concert was organized by the Filipino Community in Thailand led by the Association of Filipinos in Thailand (AFT) and supported by the Philippine Navy. There were 30 Navy officers who entertained the Filipino Community during the said concert.